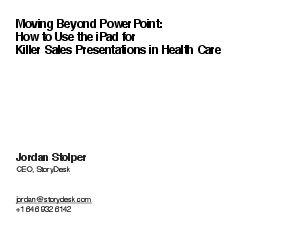 This white papers lays out viable, actionable options for iPad decision makers to move forward in creating interactive, memorable, and measurable sales presentations for their team. It includes a comprehensive survey of available technologies, weighing their relative advantages and drawbacks. Concise and easily digestible for non-technical readers.